It all started with the thought that we needed a barn cat. So when I came across a beautiful cat that had wandered onto the wildlife center where I volunteer, I took him home to be the barn cat. Well a whopping 24 hours in, he bit me which resulted in 10 days of quarantine for him and a swollen ankle for me. Needless to say, after “investing” in his stay at the vet and his health, we made friends and Rhinoceros became cat number two. (Yes, we have a cat named Rhinoceros and he has the heft to prove it.). Life was good – one Miss Willie Kitty and one barn cat overseeing the place. Well wouldn’t you know, not even a year later a tiny cat wanders into the barn, and we see her dart here and there on occasion, but we are getting nowhere near her and she is getting nowhere near us. Rhinoceros seems to be sharing his barn, and there you have it, we have cat number three, Shadow. Now we are good cat owners and Rhino was neutered and Miss Willie Kitty was spade so we had no intentions of being in the baby kitty business. But it seeems that Shadow had other plans, and clearly had a boyfriend or two, and before we could catch her, she ended up preggers. And to top it off, she had them in the barn under the attic floor. So here we are cutting up the attic flooring to dig her (I should mention a not so happy her) and her little gems out. Well that little adventure brought us Chip, Grizzly, Bear, and Petunia. Yep, numbers four, five, six, and seven. For those of you who know me personally, parting with an animal is not something I do well. Considering we’ve now raised these kittens, they are going nowhere fast. I did make one exception to send Petunia to Chicago to live with my sister-in-law turning her from country cat into city kitty. Okay, so if you’re following the math, we’re back down to six. After Shadow and crew arrived, we started seeing a black cat wander around the front yard at night, much to our dismay as we were farmtasically happy with six. Well, low and behold one evening, about 3 a.m., the old black cat decided he wanted in and started scratching at the door and meowing to high heaven. Cowboy was thrilled, as I’m sure you can imagine, and as such named the cat accordingly. You guessed it, Nightmare. He showed up in the middle of the night, and he was number seven. Perfect. Nightmare was a bit of grump (shocking) until he got sick with an abscess driving his temperature to dangerous levels, and us back to the vet. The vet tech promptly gave him an old fashioned ice bath to bring it down, which like a chicken (or maybe a sneaky genius) I opted out of participating in. This little adventure has turned Nightmare into the loviest of all. He watches the barn, but I can carry him around like a baby, rub his belly, and call him like a dog. There you have it. Seven cats who all have their shots, are micro-chipped, are all neutered/spade, and all part of our lives. Most of them live inside because I’m neurotic and worry about something getting them. God bless our vet (or maybe he should be blessing us) who lets us bring all of them in once a year for shots – yes we do it at once. We enjoy making a scene that way and clearly cementing our status as cat people. So there you have it – a true cat-splosion. It seems in the country they literally just show up. But Cowboy has made it clear, the ranch is full. So we’re hoping this is a once-in-a-lifetime kind of event, because if cats live as long as I suspect they do, we are going to be cat people for a very long time to come. 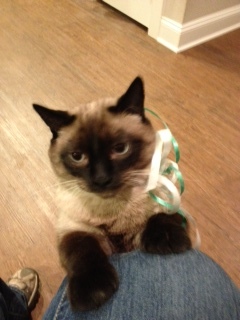 Rhinocerous (wearing his Christmas ribbons). From wild to mild, clearly he has a farmtastic life!